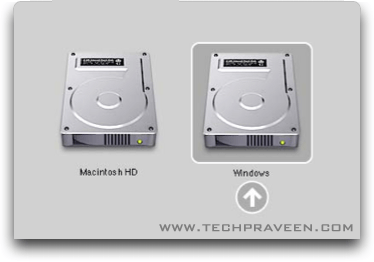 Want to know how to install Windows Xp, Windows Vista or Windows 7 on your Mac OS X? 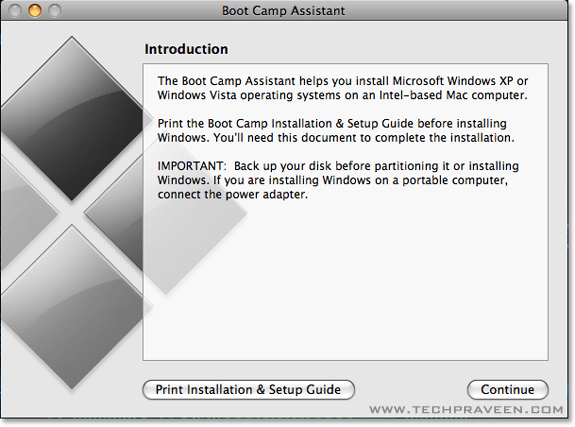 Then you are in right place.In this article, I will teach you installing windows in Mac using Boot camp assistant with screenshots.You can also use Parallels Desktop to run Windows operating system on Mac virtually. 1. Goto Applications –> Utilities and open Boot Camp Assistant. 2. Click Continue on the initial Introduction screen. 3. Set windows partition size by dragging the divider.And click Partition button. 4. Once completed you’ll notice a new BOOTCAMP drive on your desktop. 5. Now insert your Windows Xp or Vista or 7 DVD and click the Start Installation button. In this tutorial I have used Windows Xp. 6. Your Mac will restart, and Windows Xp will boot. You’ll be prompted with a window asking you which partition you want to install Windows on. Select the one with BOOTCAMP in the Name column. 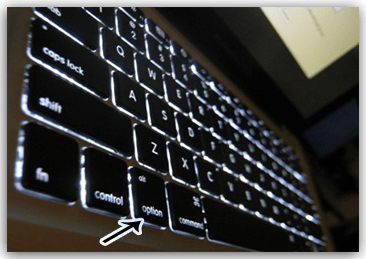 Selecting anything else may wipe out OS X or cause serious problems. Just format BOOTCAMP partition with NTFS. 8. Once the installation has completed and your Mac has restarted again, you’ll be able to use Windows Os. 9. Now insert your Mac OS X Tiger (or Snow Leopard) DVD. When prompted, select Run setup.exe. If you’re using Snow Leopard and a message pops up saying “Remote Install Mac OS X”, close that window and eject the CD. Put the CD in again and this time select “Open folder to view files”, navigate to the Bootcamp folder, and run setup.exe. 10. 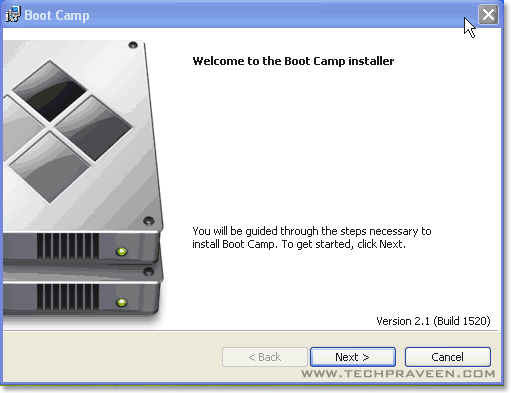 The Boot Camp installer will launch. Click Next to begin. 11. Select I accept the terms in the license agreement and then click Next. 12. 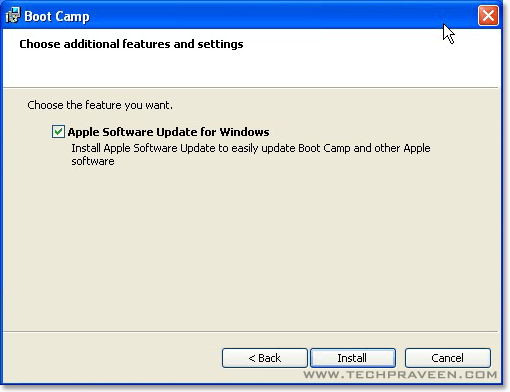 Choose Apple Software Update for Windows, and click Install. 13. 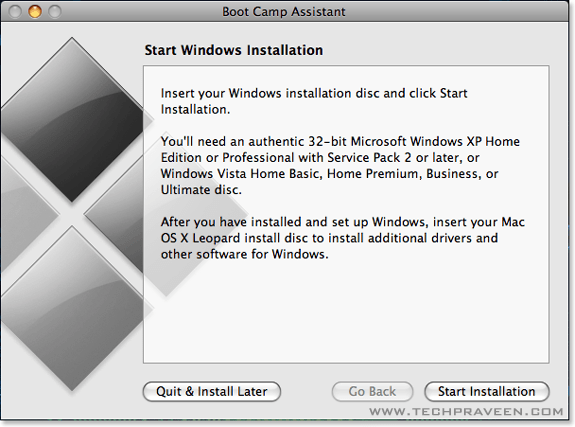 The Boot Camp installer will install all the required drivers. 14. Once completed click Finish. 15. Again you’ll be prompted to reboot. Remove your OS X DVD from the drive, and click Yes to restart. 17. When your Mac boots, hold down the Option key to select which Operating System you want to boot into. How can I revert this operation? I mean, delete the bootcamp partition and leave just one partition for Mac Osx? You can use Boot Camp Assistant to remove Windows from your computer and restore your hard disk to a single partition. 1. Goto Applications –> Utilities –> Boot Camp Assistant. 2. Select Create or Remove a windows partition. 3. Select Restore to remove windows partition and restore the disk to single partition. Do you think this is better than parrallels? I’ve never tried it but a family member just bought it and I’ve only used bootcamp. Or what about running a virtual OS, I really like using Virtualbox. Mac is cool 😉 Just to learn how to install windows in Mac I tried it…. Else I would not have installed this Windows at al in my Macbook Pro 😉 My suggestion is use Mac Os X or Linux 🙂 rather than using windows. I thought parrells was the only windows emulator. I may need to try this one out too now. This is a very nice tutorial on how to instal these operating systems. However when it comes to the real installation it is a bit hard to install these on an apple mac. I tried this i don’t find any difficulties in it 🙂 These are the screenshots taken during the installation process. found these instructions fantastic now have Windows on my mac but can’t connect to my wireless internet even though I can when booted into Mac.